Two Parasite Gliders lofted by an easy to build rocket. The rocket parts include two body tubes, plastic fincan halves, fins, launch lug and nosecone. The recovery system consists of a pre-made plastic parachute, and an elastic shock cord. The gliders are made from foam parts, each with a plastic launch hook and a set of decals. The foam wings have two adhesive strips on them that are use in the assembly of the gliders. Assembly is quick and easy. The two motor mount halves are glued together. Then following the header card picture, the fins and launch lug are glued onto the fincan, and the lower body tube is glued into place. After the glue sets, the tube coupler is glued onto the top of the lower body tube. It is important to align the launch lug on the tube coupler with the lug on the fincan. Then the upper body tube is glued on the top of the tube coupler. The shock cord is attached to the rocket using the standard glue-and-fold paper method. The parachute is pre-made, but put a dab of glue on each not to prevent them from becoming undone. The Gliders are made of foam. The launch hooks of the gliders are glued into to the foam bodies with white glue. Then the fuselage decals are applied, care has to be given, since the decals can only be applied once. Using a knife, the slots for the vertical stabilizer are cut into the decal. The stabilizer is then glued onto the body. The decals for the wings are applied, and then folded to give the wing the right angle. Do not fold them to much (the instructions recommendation is to much) because the wings will crack. Once the desired angle is achieved, the backing on the adhesive is removed. Attaching the wings is easy. 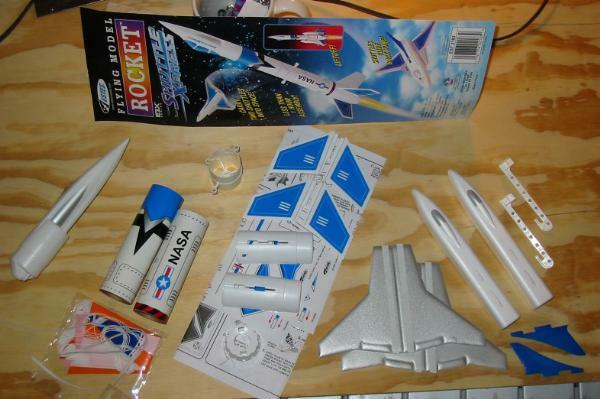 Since the rocket already has its decals in place for you and the gliders decals are applied during assemble, there is really no finishing stage of this rocket. The only problem I see is the gliders loosely hang from the side of the rocket. This may cause premature deployment of the gliders. They should have some support on the boosters fins so the gliders wings have something to rest upon. Because of the snow, I did not have the opportunity to properly trim the gliders. I knew that they we too nose heavy, and no amount of adjusting the elevators was going to fix that. The glider needed some clay to add to the tail. On the first of March, I got the opportunity to fly the rocket. I went over to Phillip Exeter Academy in Exeter, NH to witness their Team America Challenge flights. Besides their two challenge flights, we also flew some regular rockets. I loaded my Shuttle with a B6-4. There was the problems of the gliders blowing around on the booster while the rocket sat on the launch pad. Once I adjusted the rocket so the gliders would not sway, the countdown commenced and the rocket shot off with a B6-4. Very nice flight, but as predicted, the gliders nose dived into the snow. When warmer weather comes, I plan to properly trim the gliders using clay, and I may add something to the fins to prevent the gliders from swaying on the booster. I flew this weekend in perfect conditions (70 degrees, hardly a trace of wind) and agree that the gliders are nose heavy, beyond simple aileron adjustment. I bent the ailerons as far as they'd go, but the "memory" of the Styrofoam worked 'em back, and both gliders went through steep descents/dives. I think it looks like the Code Red/Ionizer/Tidal Wave with a spiffed up NC and 2 gliders. I flolded the flaps up vertical, and held them in place with pins. Then glued them up using Weldbond brand white glue. I flew it on 6-5-04 with a C6-5, and the gliders did wonderful. They circled the launch site like a couple of hawks hunting their prey. The only other mod I plan to do now, is paint the bottom of the gliders black so they will be easier to see. The reviews are great, except when discussing glider trimming. The gliders are, indeed, quite nose-heavy and require a substantial amount of tail-weight for a stable glide. Aileron adjustment is all that is mentioned in the kit's instructions, but that isn't anywhere near sufficient.